On Lorna Shore's sophomore album 'Flesh Coffin,' the band digs deep into the "process of death." 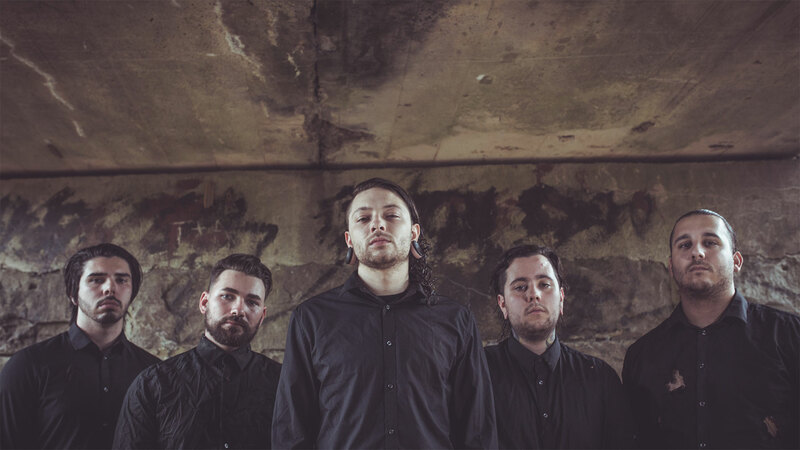 Lorna Shore has been building an empire in deathcore since 2010. They released three EPs before their debut studio album, and now the New Jersey natives present Flesh Coffin, the band’s second full-length album and their first release with Outerloop Records. The album’s single, “Denounce the Light,” dropped in November, followed by their music video for “FVNERAL MOON” in January. Amidst a hefty tour schedule with Carnifex and Despised Icon, guitarist Adam De Micco took some time between shows to talk with me about the conception of their new record and the force behind Lorna Shore. He passionately unveils the band’s vision for their aggressive sound and delves into the album’s intricate depiction of the complexities of death. This is your second full-length album, correct? How does it compare to the last? Yes, it is. I think it’s a hundred times better, personally. I think it’s a more mature, real-life sound of the band. When we wrote the previous album’s songs, we were figuring out how we wanted to sound — and I think we learned a lot about what we wanted to do on that one — but, with this album, now we’ve really honed in and figured out how we wanted to sound. It’s a way more mature vision of the band this time around. That’s why I think it’s a hundred times better. But I think every band feels that their current material is way better than their predecessors. It usually starts with me coming up with a bunch of ideas and showing the band, and then we just put songs together. This time around, we were able to demo everything. So I was working on stuff and then our drummer, Austin, would come over and we would add drums and put the songs together. At that point, we’d take it to the studio and that’s where Tom finalizes his lyrics and goes over everything. It’s a long work in progress, if you will. So do you mean that you guys arrange and finish writing in the studio? Not really. The only thing that gets finished in the studio is vocals, more or less, because it takes a lot longer to finish up instrumentals. We go into the studio with all the instrumentals pretty much done. And then vocals just get finished up at the end because we need to make sure we have the song finalized. I don’t like to give Tom songs that are unfinished because it can get convoluted and confusing. So, usually, we wait until we have a song finalized and, when we get to the studio, he can finish up lyrics and vocals there. So since you’re the main songwriter in the band, does that mean you started the band? I did not start the band, but I am the main songwriter. I kind of got thrown into it. I used to be in a band with Tom and he was the vocalist at that point in time. They were getting rid of their songwriter/guitarist, so, when I joined, they said I would need to take on the role of writing. I said that’s perfectly fine. So pretty much since I joined, I’ve been the primary songwriter of the band. How did you break your genre? To be honest, I don’t really know. We just kind of fell into it, if you will. It was a long progression to get into it, you know? When I initially joined the band, everyone wanted to sound different and had a different goal for what they wanted the band to be. I think as other members left, me and Tom, especially, were the ones to achieve that sound because we share a lot of general interests in this style of music. From that point, we kind of put our foot down about what we wanted to sound like, and we don’t really want to change based on what everyone else in the band wanted. It was kind of like, if you’re not going to be a part of it and go with it, then it’s just not going to work out for you. But it’s pretty much music that we like, you know? We’re still fans of music and fans of bands that we’ve either played with or look up to, and we still enjoy this genre of music. Our music is basically a collection of everything we enjoy as a band. You kind of just play what you like, and that’s no different here. We just take all our influences and bands we listen to on a daily basis and make put together a new song. I feel like that’s where all these sub-genres of metal have come from. Yeah! It’s weird. It’s becoming more confusing with all these sub-genres. People just like different styles of music and they want to put that into their own music. I don’t think there needs to be a four-adjective sub-categorization of a band. It’s really just a band’s take on music. It gets so much more confusing when you add these real descriptive adjectives describing a genre of music. If a genre fits with only one band, it isn’t really a genre, is it? Or is it just a band’s original sound? We don’t really try to fit into a genre, we just like what we like and take from bands and artists that we enjoy and put it all together. We’re not trying to have this boxed-in category of music. Who is your biggest influence for the sound of this band? And specifically for you, guitar-wise? Bands that I really enjoy are tech-death and death metal bands like Necrophagist, Obscura, a lot of those European tech-death bands. As far as guitar players, I’m a huge fan of the ’80s, all those hair metal, ’80s shredders. Yngwie Malmsteen, Jason Becker, all those guys who were killing it with instrumental music back then. I got into that before I got into the more extreme side of music. I was taking guitar lessons, and that’s what I would be fed and then I kind of under-appreciated the technical side of music and metal specifically. Then I branched into appreciating more technical, aggressive music. A lot of other members in the band share a lot of those interests, but they also have their own differences. So my personal influence just stems from those ’80s guitar players, but also a ton of modern day players, too, like Guthrie Govan, Rick Graham, as well as a lot of people who are in current bands. I can find influence from whoever. If you do something that’s sick, I’m going to enjoy it and be influenced by it and do it in my own sort of way. Tell me about the new album. Is there a theme or a concept we should look for? Yeah, there is a bit of a concept. It’s a story about a person going through the whole process of death. Not just the process of dying, but even further beyond that. I feel like, lyrically, a lot of stuff goes to the point of dying and that’s it. Our vocalist talks about how we really just want you to have a whole story from the beginning of the process to further beyond that. That’s what the lyrics are about in a nutshell. He would have a better understanding than I would. That’s the theme throughout the entire album, which is cool because we’ve never done a concept album before. Every song in the past has always been a separate entity from the others. Your music video for “Funeral Moon” was intense. Who came up with that storyline? We worked with (director) Joey Durango, and it was basically us going back and forth with him. We wanted to work with someone and see what their take on the music and lyrics was. So he listened to it and kind of came up with some ideas and sent it our way, and we’d just go back and forth. We really trusted him because he got really into it and really wanted to do it, so we let him go with free reign. It was mostly him coming up with concepts and us giving him a little bit of guidance. And since we were on the same page, we didn’t have to sit there and meticulously edit every single thing. And you’re on tour right now, yes? Are you playing new music? Yeah, we’re predominantly playing new music. We have a short set and our new songs are quite long, so we only get to play five songs. Three of the five songs we’re playing are off the new album. And how are people responding to it? It’s cool to see. We have our music video and our single that we just released, so those are the ones that people are more aware of. And we’re playing another new song which hasn’t been released yet. So even from the little bit that we’ve played, it’s cool to see that people are already responding to the new material. It’s just crazy because this stuff hasn’t even been out that long yet. What has been your favorite part of this new album process? Well, for me, in every album process, it’s the writing. I enjoy the writing and recording side because that’s what I enjoy most about being in the band, that being the creative part of it. It’s like taking something from the ground up and seeing it come to fruition. So for me, it’s writing and demo-ing it to hearing it in a way-better quality in the studio and hearing the songs back. I just like that whole process. It’s really rewarding to see something that was nothing at one point become something that you didn’t anticipate. Not that I don’t enjoy touring and playing songs, but I get the most enjoyment out of the writing process and seeing them come to life. Is there anything else about Lorna Shore that you think we need to know? I guess just that we’re everyday average dudes that play music. We don’t really like the image of bands being perceived as “above” everyone else. We just like to write music, and I want fans of our band to know that they can approach us in any sort of way. They can talk to us about anything, because we’re just regular people like anybody else. I hated meeting bands when I felt brushed off because I wasn’t on their level, and we don’t want to treat people that way. We’re pretty down to earth dudes and I think we’re pretty approachable and we try to connect with people. Lorna Shore was posted on March 5, 2017 for HM Magazine and authored by Nao Lewandowski.